While young Dalit painter Anil Vardhan is all set to go ahead with his third one-man show in Ahmedabad's Ravishankar Raval Kala Bhavan on paintings which which seek to provide an exposure into his experiments with colour intermingled with his love for music, a tete-a-tete with the young artist revealed his other side -- his deep anger over atrocities on Dalits and their incessant fight against untouchability. Vardhan possibly believes that by exposing works before a wider audience would require him to display themes of love and music. However, he told Counterview, "Time will come when I will be only displaying things that tell a wider social message, of untouchability and caste discrimination." Inspired to paint on themes of caste discrimination by well-known Dalit rights activist Martin Macwan, who is founder of the Dalit Shakti Kendra (DSK), a technical institute near the industrial hub of Sanand, which houses Prime Minister Narendra Modi's pet Tata Nano car plant, Vardhan showed some of his excellent art works on Dalit issues, which have been carefully preserved at DSK. Reaching DSK on way to Ahmedabad, where his exhibits will be opened by former National Institute of Design (NID) director Ashoke Chatterjee and Mudra Institute of Communications, Ahmedabad (MICA) director Preeti Shroff on Tuesday, he took this reporter around DSK to show his small as well as life-sized art works ranging from themes like Dalits being offered water from a distance in Gujarat villages, to how they are denied permission in temples. 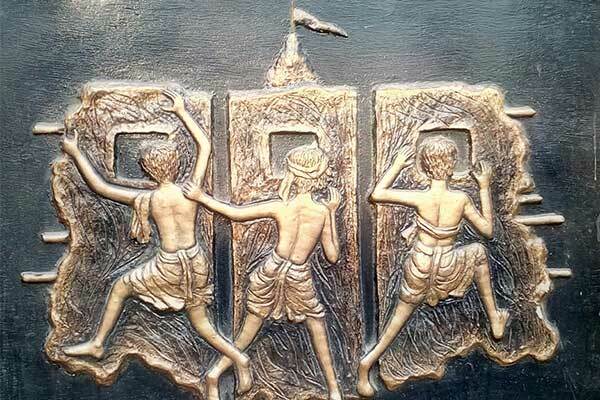 Based on the temple theme, one of Vardhan's art works showed how Dalits were forced to peep from the holes from outside a top Odisha temple to have a glimpse of the offerings before the God because they were not allowed in. Standing next by him, Macwan explained, "It is an important chapter of Dalit history. It took a court order to stop the despicable practice. Significantly, decades ago, a similar practice prevailed at Gujarat's famous Santram Temple of Nadiad." Also on preserved at DSK are Vardhan's 98 illustrations he prepared to highlight as many types of discrimination prevailing in Gujarat's rural areas. "These illustrations, on paper mash, suggest as 98 different questions posed to Dalits across Gujarat during a complete survey of untouchability practices prevailing in the rural areas in 2009", he said, displaying a few of them to this reporter. On display at DSK, apart from his paintings, include Vardhan's miniatures, murals and wall paintings. 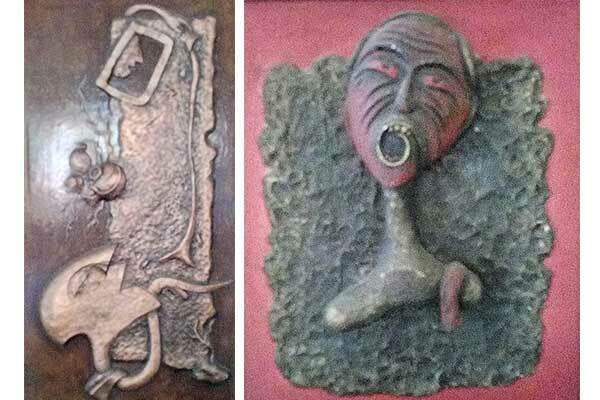 Asked whether he was displaying these and many other art works showcasing Dalit atrocities, Vardhan, who is a primary school art teacher in Shihor, Bhavnagar district, and has been associated with DSK for about a decade, said, "I will showcase as an example few of the artefacts at the Ravishankar Raval gallery. However, I am waiting for an appropriate time to highlight these works. They will surely form part of the Dalit museum, being planned at DSK." Intervened Macwan, "While Vardhan's works would form a major part The Dalit art museum, which we are planning at DSK, he is not the only artist who will find a space." He added, taking this reporter around DSK to show others' works, "Several artists have contributed their paintings and other art works to DSK on caste-based atrocities theme and would find a prominent place include well-known American black painter Juliet Seignous' 28 paintings preserved at DSK; Rina Vaghela, a brilliant fine arts student at Vallabh Vidyanagar; and Savi Savarkar, whose painting on Dalits and cow was attacked by saffron brigade in Maharashtra."